Cabiokid, located 90km from Manila, in Nueva Ecija (Luzon island), is a 5.5 hectare integrated farm implementing permaculture methods and principles as well as eco-tourism. It also functions as a development project site for the latest in permaculture technologies (engineering, education and local economics). The foundation’s name is pronounced “Ka-bee-o-kid”, a play around the words “bukid” (“field” in Filipino) and the word “bio”. They also offer training and educational courses in nature-based technologies and permaculture. The foundation site is a former rice farm that used non-sustainable methods and chemicals but was restored in 2001 to its rich soil state with organic farming. It now hosts over a thousand plant species, some livestock, with ponds and waterways in the background. Rice is still the main focus of harvest on the farm. - At present the foundation is working to promote sustainable development ideas by doing demos on doable eco-friendly solutions targeting the surrounding local communities, the youth and the marginalized sector. - Regular 3-7 day permaculture courses are offered with actual examples on the site. Tailor made courses can also be requested on similar topics, including alternative building, waste management and human resource management. - The Wildlife preservation project is underway in cooperation with local government agencies. - The “BEMBU” program aims to develop bamboo as an alternative building resource. - The Cabiokid store and library offers educational resources as well as farm products for sale. They can also contact the farm to rent facilities for tours and seminars. The Sustainable Technologies and Entrepreneurial Permaculture Program (STEP) initiative, in cooperation with the Isabela provincial government, Antwerp (Belguim), and SALIS aims to teach sustainable livelihood to local communities as well as provide ecological awareness about global warming. 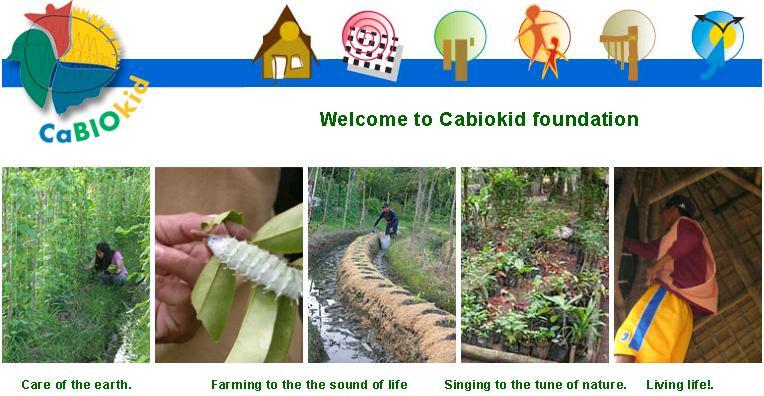 Cabiokid targets to build information centers (organic highways and learning resource centers) to do this. Cabiokid, in cooperation with Happy Earth, plans expansion through development of an additional 4 hectare land nearby. Development plans include plowing and planting, along with fencing the area. The Basic Ecology Project aims to provide environmental lessons to elementary school children, with modules from a partner school in Belguim. This culminates in planting activities, lectures and an educational tour on the Cabiokid farm. Volunteers and working students are welcome on the farm. They can contact Angelito Agustin, Area manager, at cabiokid@yahoo.com for more information. This entry was posted on Saturday, June 5th, 2010 at 3:55 pm	and is filed under Permaculture Courses, Philippine projects, Volunteer Opportunities. You can follow any responses to this entry through the RSS 2.0 feed. You can leave a response, or trackback from your own site.